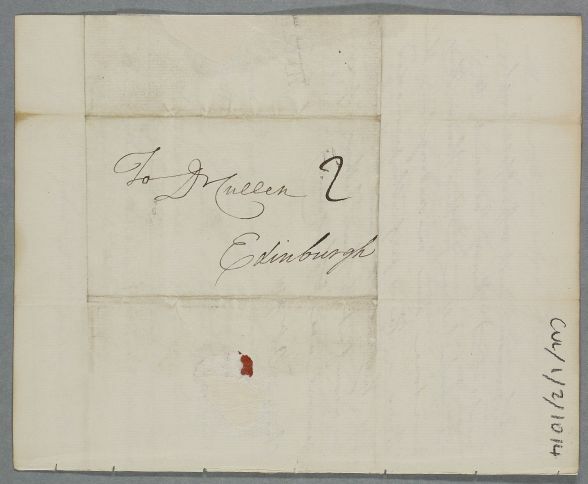 Letter from Dr Alexander Stevenson concerning the case of Lady Grace Campbell. 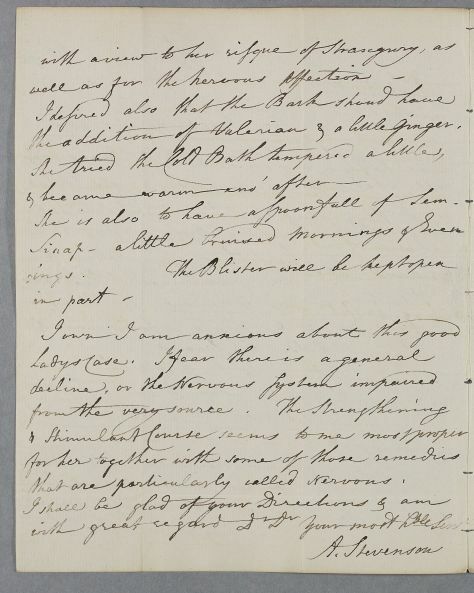 He also thanks Cullen's sons Henry and Archibald for sending him their theses, and is 'perfectly persuaded that they will do honor to the Laurel be comfort to their father and of very general use to their country'. 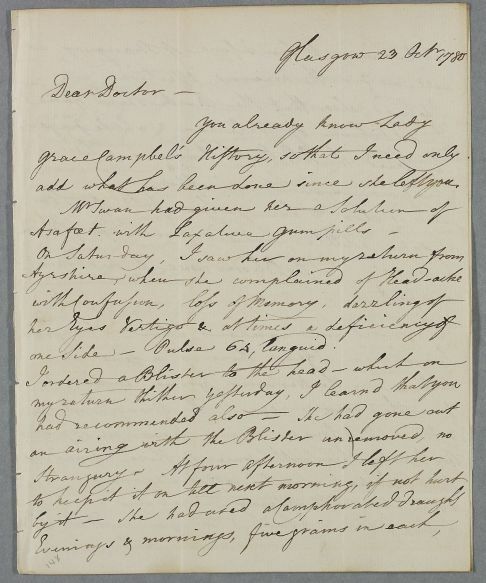 Summary Letter from Dr Alexander Stevenson concerning the case of Lady Grace Campbell. 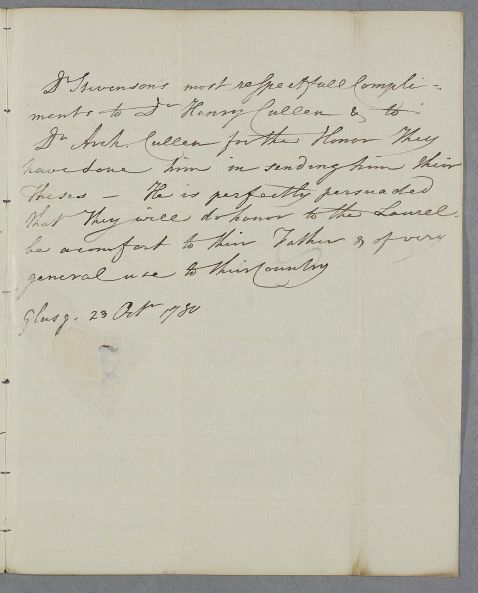 He also thanks Cullen's sons Henry and Archibald for sending him their theses, and is 'perfectly persuaded that they will do honor to the Laurel be comfort to their father and of very general use to their country'. Case of Lady Grace Campbell who is generally deprived of her 'powers' and suffers vertigo, headaches and other 'nervous' symptoms [see earlier Case 340]. add what has been done since she left you. one Side - Pulse 64, languid. She is also to have a Spoonfull of Sem. that are particularly called Nervous . 1: See Henry Cullen Dissertatio Medica, inauguralis, de consuetudine, ejusque vi et effectibus in corpus humanum (Edinburgh: 1780) and Archibald Cullen, Dissertatio medica, inauguralis. De frigore, ejusque vi et effectibus in corpus humanum. (Edinburgh: 1780). Although both sons studied medicine, only Henry became a physician (attached to Edinburgh Royal Infirmary), while Archibald eventually became a lawyer in London. As a close associate of Cullen, Gilchrist was on familiar terms with the whole family.